You may have heard the advice, never put anything in your ears. Yet many do this to keep their ears ‘clean’. Many find ear wax to be pretty gross, so we don’t blame you for regularly reaching for cotton swabs. However, you put your ears and hearing at risk every time you clean your ears with cotton swabs. The tiny bones of the middle ear (ossicles) and the eardrum are very easy to damage, as well as the skin of the ear canal. Also, ear cleaning mistakes like using Q-Tips can break the skin, and can leave you open to infection. Since ear wax is made at the opening of the ear canal, the wax is likely to fall out on its own. This is why we shouldn’t stick anything in our ears! If you want to keep your ears healthy and in good shape, check out some the most common ear cleaning mistakes many make. If you are guilty of any, make sure you ditch the habit(s) ASAP. While this may sound strange, some people stick objects into their ears when they feel discomfort. Objects can range from your fingers, nails, keys, pens, pencils, and bobby pins. However, placing any object in your ear can damage the inner and outer ear, as well as damage the sensitive skin within the ear canal. If your ears are causing you discomfort it is important that you see your doctor, and don’t use your fingers or other objects to give you relief. 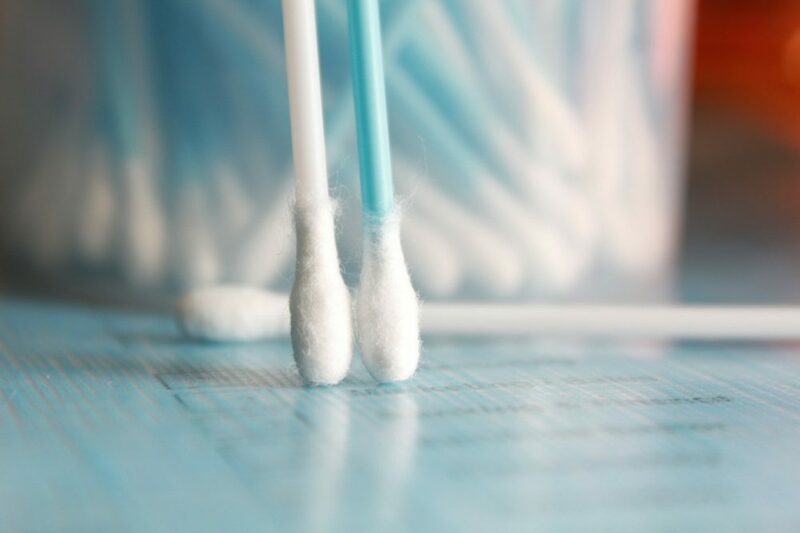 While Q-Tips and other cotton swab products is an everyday staple, they are NOT meant for ears. The rigid, pointy shape on cotton swabs can easily damage the ossicles, eardrum, and the skin of the ear canal. Using cotton swabs can cause cerumen impaction by pushing the ear wax deep within the ear. You also run the risk of the cotton head becoming lodged in your ear, which will require a doctor to have it removed. Did you know that your ears are considered to be “self-cleaning”? In fact, most people don’t need to ever clean their ears! The skin within the ear grows in such a direction that it carries our skin debris and wax out of the canal to the outer ear. So no need to dig for ear wax treasure! Once the wax reaches the outer ear, you can then gently brush it out with a clean washcloth. Candling and rinsing with a syringe are just a few examples of alternative ear cleaning methods that some people use to remove ear wax. However, these methods are not recommended and should be avoided. While rinsing your ears out with a syringe is safe when done correctly, you can give yourself swimmer’s ear if the ear isn’t dried properly after rinsing. The other alternative method listed, candling, can be extremely dangerous. Candling is when a cone-shaped, hollow, lit candle is placed into the ear. Research has shown candling to be bunk, and should not be attempted due to the risk of fire and eardrum perforations. Remember, the only safe way to remove ear wax is to leave it alone and let it come out naturally. Once ear wax reaches the outer ear, it can be brushed gently away with a washcloth. However, if you have an overproduction of ear wax or if the built-up wax in your ear is bothersome, make an appointment with your otolaryngologist to have your ears cleaned. Air Travel and Your Sinuses, Is It Safe? Click here to ask the doctors.